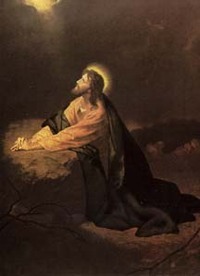 Although Luke's version of the Lord’s Prayer, or the Our Father, from today’s readings is not the traditional prayer that we are accustomed to including in our liturgies, it has a lot to recommend it to the cultivation of faith in one whose faith is yet growing, and really that means all of us. Why? Primarily because of the sheer brevity of the prayer it demands that we place everything in the hands of God. It demands that we trust absolutely. Often in my prayer life, as in my writing, I tend to want to say more than I should. In prayer, faith takes trust, as I said above. Certainly, I believe that there is much to gain from taking the time to have a heart-to-heart talk with God. Often in spiritual counseling situations I recommend just that—a long conversation with the Almighty. Yet equally important, perhaps even more, are the times in prayer when we trust that God knows our needs even before we think to voice them. It may be that the times in our lives when the short prayer of today’s gospel is most appropriate are the times that require the greatest trust: namely, the short prayer of faith may be most appropriate when there is some perceived trial or struggle. This is our opportunity to show God the faith that is in our hearts. Therefore, it makes sense to save the long conversational prayer for the good times. Save it for those moments in your life when everything is going the way it should: this too will demonstrate your faith. Human nature is somewhat ironic if I read it right in myself. Isn’t it true that we typically save the long prayers for the times when there’s trouble in our lives or when something ominous is looming somewhere on the horizon? And contrarily, do we not reserve the short prayers—if in such moments we pray at all—for the times when we feel most happy and secure? As I look at the world in which we live, at the manifold threats against peace, and at the upside down values that put religion at the service of war or plant hate in the hearts of children and teach them to serve ideologies instead of God, I have to admit that I’m tempted to ask why for hours upon end. Sometimes also, I face personal situations that make me want to pray all the way on my long drive to work and back home. Speaking for myself, I have to learn to save my best and longest conversations with God for the times when I feel the most blessing. However, we're guaranteed that God will hear our prayer of faith in the harder times. All we need is to bare our hearts—words are not all that important. An attitude of gratitude seems more crucially important every day.